This Reverse Osmosis Filtration System is intended where source water pressure might be a concern. More water in less time. 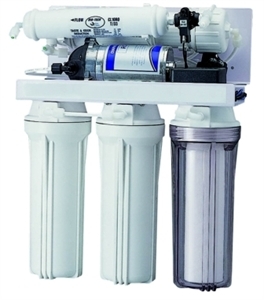 Light RO Water Filter Reverse Osmosis System with Pump. This Reverse Osmosis Filtration System is intended where source water pressure might be a concern. Water Quality is consistent throughout all HealthyWaterSupply models. Booster pump gives RO system ability to increase its productivity. More water in less time. It will get the job done with greatly improved productivity over Light RO, but you would have to keep record of all filter changes and check water quality periodically. It comes with 75 Gallons per day membrane and 5 Gallon Storage tank. Suitable for City or Well water source. HWS Light RO Plus Five Stage Reverse Osmosis system begins with stage 1, a five micron Sediment filter that traps particulate matter like dirt, rust, and silt that will affect the taste and appearance of your water. Stage 2 is a five micron Carbon Block filter that provides a reduction of chlorine and other materials that cause bad taste and odors. Stage 3 is GAC (Granulated Activated Carbon) filter which provides a greater reduction of chlorine and can remove up to 95% of VOCs, TOCs, chemicals and others contaminants (these are called PRE-filters because they filter in front of the reverse osmosis membrane). Stage 4 is the heart of the reverse osmosis system, the RO Membrane. This semi permeable membrane will effectively remove TDS (total dissolved solids), Sodium and a wide range of contaminants such as Percolate, Chromium, Arsenic, Copper and Lead. It will also remove cysts such as Giardia and Cryptosporidium. Stage 5 is a high quality Alkaline Post Filter (this is called a Post filter because it filters after the membrane). This filter is final polishing filter used as the water is leaving the storage tank on its way up to the faucet. It returns beneficial minerals to water- Calcium and Magnesium. It also Increases water Ph to alkaline level. HealthyWaterSupply Alkaline Post Filter Contains 40% Carbon for final polishing, 40% Calcite and 20% Corosex to improve taste. The end result? Great tasting water!